This week’s show will be all about the London Classic, which had an entirely different character than when we left off last week. We are out a bit later this week due to my travels to and from the National Grade Championships in Orlando, but that gives me the chance to report final results from the Classic. 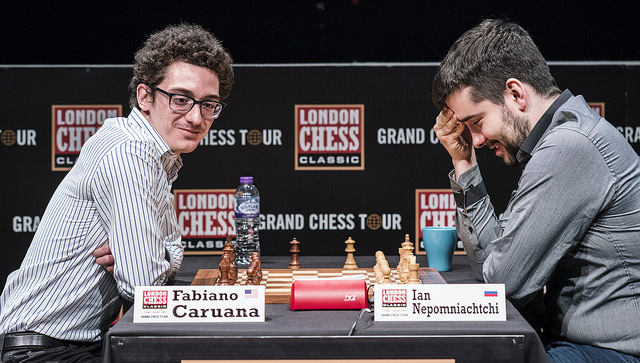 In a tournament where almost no one won more than one game, five players went winless, and four went undefeated - Fabiano Caruana and Ian Nepomniachtchi paced the field with 6/9. Caruana emerged victorious in the playoff to take the title. For some time it looked like Caruana was playing alone as he won not just the first game of the event in round four(against Karjakin), but the second as well in round five. 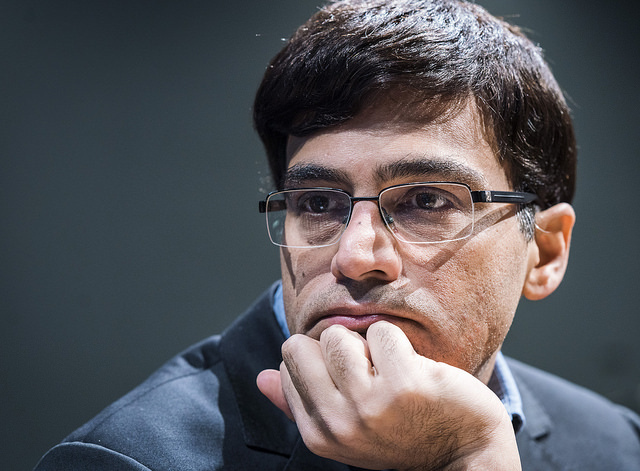 Let’s take a look at that gradual attack which broke through against Vishy Anand. Fabiano slowed down after that, only to see Nepom spring into action. Overcoming Adams in a long endgame in round six, Nepom started a string of three straight victories which vaulted him into the lead. The second was the sharpest, with both players playing with spirit and abandon. The loser was unfortunately again the hapless Anand. The critical game came in round eight when Nepom took on an out-of-sorts Carlsen who was suffering from a cold. Carlsen’s condition definitely played a role as Nepom was able to counterpunch to victory. Carlsen bounced back with a win over Aronian in the last round. It seemed that Aronian controlled most of that game, sacrificed a piece rather unnecessarily, and followed it up poorly. 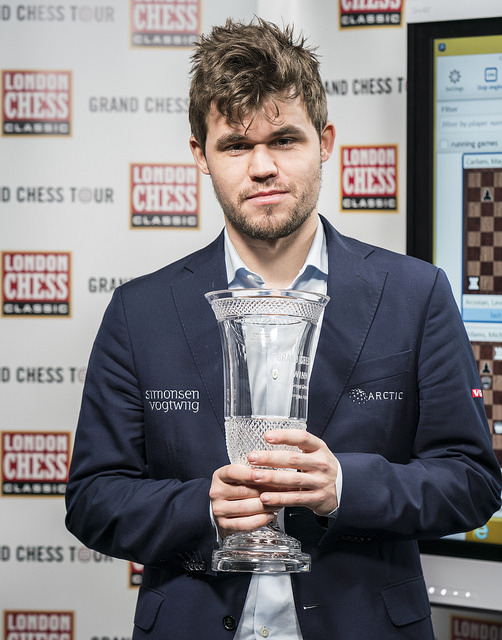 Aronian absorbed his first loss against zero wins, while Carlsen moved up to a tie for third with Vachier Lagrave and Wesley So. He also took first in the final overall standings in the Grand Chess Tour. Meanwhile, Hikaru Nakamura, whose play I touted in the first three rounds, ended up drawing every game. 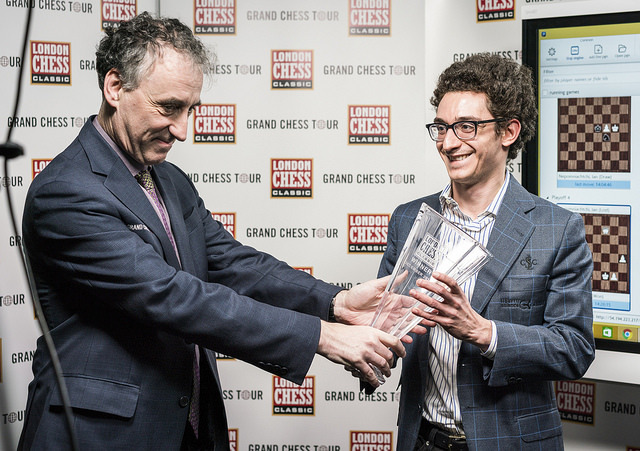 So Nepom put the pressure on Caruana, who responded by defeating poor Mickey Adams, who combined with Anand for more than half of the losses in London. That set the stage for the playoff, and the decisive blow was landed in the fourth game. There was certainly some consternation after the first fifteen games produced no winners or losers, and ten decisive games in nine rounds is a low total. But the last three rounds produced seven decisive games, and you can’t complain about a finish like that. I think the averages suggest two out of five decisive games per round, but it’s normal that the wins and losses will not be evenly distributed in each round. So hopefully we have staved off panic about draws destroying chess until the next time. Next week I’ll tell you how the Russian Superfinal turned out, and I’ll probably have some thoughts about AphaZero’s stunning victory over Stockfish in an unofficial match…right now I am still processing this result and would like to take a closer look at the games.